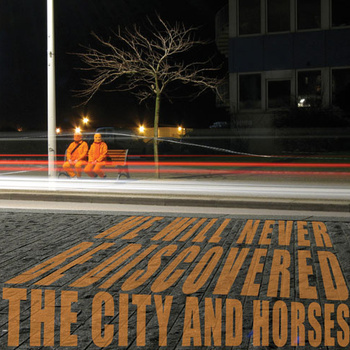 The City and Horses are clearly no strangers to being strange, and the video to title-track and first single ‘We Will Never Be Discovered’ is a delightfully bizarre orange affair, well worth watching. Marc Cantone’s half-spoken/half-sang vocals are put to good use, as the song also opens We will never be discovered. The band’s take on pop music is an interesting one, to say the least, but it’s also refreshing to hear something so original you struggle to compare it to anything else. Songs like ‘The Company, Inc’, focussing on a workplace romance, looks at love in a humorous way, not unlike if Los Campesinos! would cheer up once in a while. Katie Costello’s wonderful vocals also need a mention. They intertwine with Marc Capone wonderfully on a lot of tracks, generally adding to the relaxed, chilled-out vibes that the whole album radiates. For every slow, slightly morose ‘May I Love Someone Soon’ there’s an upbeat, almost surfer-pop ‘With His Pen’ to follow it up, ensuring that the album definitely keeps you on your toes. Some tracks, like ‘This Is Manhattan’ and ‘Nights Like These’ are so painfully cool that they sound almost purpose-made for an equally painfully trendy film’s soundtrack (why hello, 500 Days of Summer, how nice of you to stop by. There’s a couple of Michael Cera vehicles on their way too, save some PBR for them). That’s not to say they’re bad tracks though; in fact, the opposite is true. ‘Dum De Dum’, towards the end of the album, is definitely a highlight, with just the right amount of energy being a persistent beat and Katie Costello’s vocals making another appearance alongside some friendly strings. Overall, it’s worth hoping that We Will Never Be Discovered doesn’t become a self-fulfilling prophecy, because this is an album that deserves to be heard. It’s clever, catchy, and never boring. The City and Horses Website. Facebook. Twitter. Bandcamp. Posted in ALL HAIL KING SQUIRREL, Indie, reviewsTagged Paper garden records, The City and Horses, We will never be discoveredBookmark the permalink.